There’s a famous anecdote about the voyage of the Granma, the tiny vessel that left Mexico sixty years before the day that Fidel Castro died this week. As the boat was nearing its destination in the east of Cuba, after two years of preparation, a man fell overboard. Possibly wrecking the entire mission, Fidel Castro refused to leave. The overloaded yacht went round and round in the dark until the man was finally spotted and rescued. It’s more than a story. It exemplifies a philosophical conception of human beings, and our value, that goes back hundreds of years in Cuba and millennia elsewhere. It is not the view most of us live by, in the North at least. While European philosophers were pushing liberalism, giving centrality to the individual self, early in the nineteenth century, Cuban independence activists expressed indigenous beliefs about the fundamental and powerful interdependence of all peoples and the earth. We don’t live well unless others live well. We depend for our wisdom, health and capacities upon what we give to and receive back from other beings, no matter how small and seemingly insignificant. It was the philosophy of José Martí, who led Cuba’s last independence war against Spain. Fidel Castro, in subtle and fascinating ways, always credited nineteenth century Latin American philosophers, especially Martí, with the direction of the Cuban Revolution. Cuba’s humanist ideas explain its long resistance to the US financial, commercial and economic blockade, according to former Argentinean president, Cristina Fernández. The threat of increasingly sophisticated weapons, Castro once said, requires ideas: “Sow ideas, sow ideas, and sow ideas; sow awareness, sow awareness and sow awareness”. Some will shake their heads. But ideas change how we think, which changes how we speak and how we act. It’s a simple truth, recognizing cause and effect. In Caracus, after Hugo Chávez was first elected, Fidel said people suffer because of “nicely sweetened but rotten ideas … that man is an animal moved only by a carrot or when beaten by a whip.” That is, we suffer because of false ideas about what it means to be human. Cuba surprised the world when, after the collapse of the Soviet Union, Cubans continued proclaiming independence and socialism. Their system was expected to collapse, within months. The world was surprised again, when Castro stepped down because of illness in 2006, and life in Cuba went on as usual. The presumed chaos and disorder did not happen. There’s plenty of documentation about Cuba’s internationalism, which continues. In 2014, the Wall Street Journal reported that “Few have heeded the call [to fight Ebola], but one country responded in strength: Cuba.” Cuba sent more than 450 doctors and nurses, chosen from more than 15,000 volunteers, by far the largest medical mission sent by any country. More than 15,000 Cuban medical volunteers identified their personal stake in the West African tragedy. In 2007, Cuban doctors, working in Bolivia, restored the sight of Mario Teran, the Bolivian sergeant who shot dead Che Guevara. Cuban press reported: “Che returns to win yet another battle”. None of these events were miracles. There is an explanation. It has to do with ideas. Philosophical ideas. The same ideas that explain why an entire mission, to liberate a country, was put at risk for one man. In Caracas, Castro said, “We are winning the battle for ideas… They discovered ‘smart weapons’ but we discovered something more powerful, namely, the idea that humans think and feel.” In a speech on December 2, 2001, months after the attack on New York City, he said, “There is no more powerful weapon than an individual who knows who she is and where she is going”. 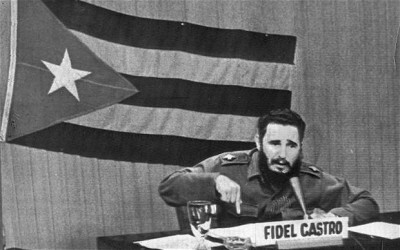 It’s perhaps true, as Fidel said at his self-defense in 1953, that history will be the final judge. But the philosophical foundations of the Cuban revolution can be known and tried out now. Martí famously claimed that weapons of ideas are more powerful than weapons of steel. Fidel’s ideas are out there, in speeches, interviews and declarations. They can be known, and tested. The results are certainly known (even though mostly ignored in the North). They’ll be talked about in these sad days, by those who are brave and smart enough to see beyond one of the most massive disinformation campaigns ever. Nonetheless, the ideas get little credit. They are deeply philosophical, having to do with how we know, and who we are, as human beings. Marx, after all, said human beings are distinct from other animals precisely because we care about what it means to be the species we are: We don’t just want to live well as human beings. We want to know that we do. If we take up the challenge, we won’t have to wait for history to judge Fidel Castro. We can know and experience the benefits of living more sensibly, in solidarity with other peoples. The world has lost an example, admired across the planet by those who suffer, and those who care about their suffering. Luckily, the ideas remain, and there are people who care about that too.